<i>Slices</i> issue 4-13, coming soon! The final Slices of 2013 is nearly upon us and we’re ending the year with a bang. First up, check out the cover star. Jon Hopkins emerges as one of its brightest stars of the year thanks to his outstanding fourth album Immunity. Laden with critical praise—and a Mercury Prize nomination—the record represents Hopkins’ techno renaissance. What better time for the Slices team to land the inside story. 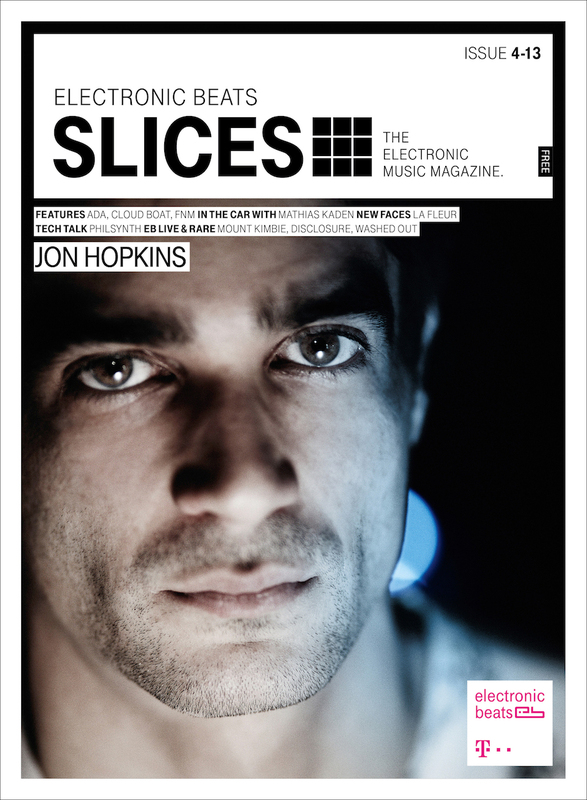 Alongside Hopkins, Slices gets face time with three other protagonists leading the way in their respective areas of electronic music: the melodic techno producer and Pampa affiliate Ada, London-based masters of doleful, folk-flavored bass music Cloud Boat and Berlin’s producer FNM, better known as Filippo Moscatello. This issue’s In The Car feature sees Slices riding shotgun with house producer, in-demand DJ and recent Watergate 14 compiler Mathias Kaden. We’ll also be getting to know the new star of luxe house and techno La Fleur, a Swedish producer whose sets at Panorama Bar and Watergate have won her lots of fans. Back down on earth we’ll be chatting vintage synths with the aptly named PhilSynth in Tech Talk. All this plus the usual bundle of Live & Rare content, this time featuring Mount Kimbie, Disclosure, and Washed Out. Slices 4-13 hits the shelves on December 5th. Head here to subscribe to the full DVD series, or pick up your free copy from one of these locations. You can also find even more Slices features on our YouTube Channel. Meanwhile, watch our latest Slices interview, featuring Andre Bratten and taken from issue 3-13, below.